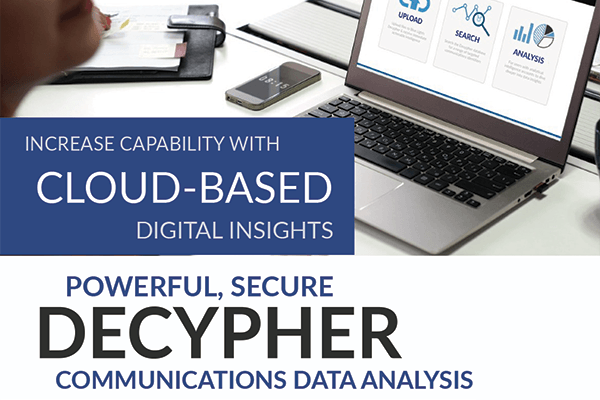 We are delighted to launch Decypher, a major advance in communications data analysis, through a joint initiative with Blue Lights Digital. For the first time, investigators, analysts and DMIs can securely process comms data without delay, and receive a standardised cleansed Excel call schedule and an automated analytical pdf report with key investigative insights. This new platform combines an innovative and simple user interface developed by Blue Lights Digital and the power of our CDAN software (class leading automatic evidential comms data processing and reporting) to enable immediate CDR processing and reporting as a ‘pay as you go’ cloud service. Users can be reassured that historical security concerns about cloud services are no longer an issue. The data is processed in RAM, securely hosted by AWS at UK Government assured Official-Sensitive level and GDPR compliant. Once data processing and analysis is complete, all data is deleted from the system.